Cross-promoting your blog posts on Social Media is a fundamental way to drive new readers to your website and skyrocket your blog traffic. In fact, with the right posting strategy you can even triple your page visits. But how can you set up an effective Social Media Posting Schedule to reach as many followers as possible? Learn when and how to set up an effective Social Media Posting Schedule and increase your impressions, likes, shares, retweets, and boost your blog traffic. To come up with a successful posting strategy and make the most of publishing your blog posts on social media, take a look at the key factors for reach, visibility and engagement. After all, only followers who see your posts in their social feeds and find them interesting, will eventually visit your blog and let your website traffic shoot through the roof. Do you get enough outreach when you publish your post? Whenever you post to social media, only a fraction of your followers will actually see your post. Your reach also depends on the level of activity in your community at the time you publish your post. If only 10 % of your followers are online, only 10 % of your followers will get the chance see your post. Therefore, you should make sure to hit the rush hours of every network and the best time to post for maximum visibility on Social Media. While Twitter is busy throughout the day, other networks such as Facebook, Instagram and Pinterest are especially crowded during the afternoon and in the evenings. Business networks such as LinkedIn and XING are most frequented during the morning hours when most people are on their way to work and in the afternoon right before they leave the office. 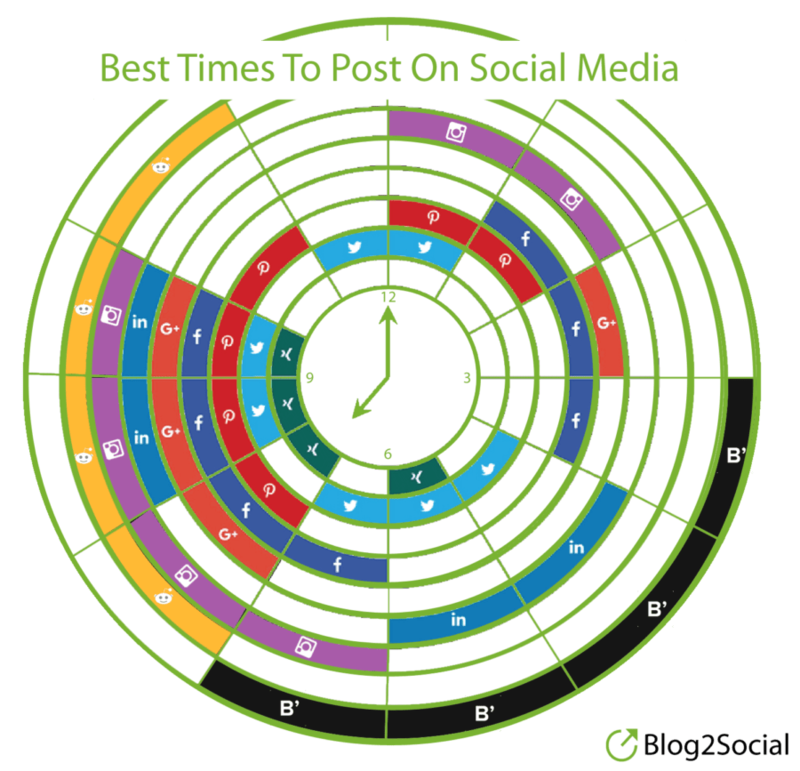 So before you set up your Social Media Posting Schedule, take a look at the best times for each network. Posting at the right times can help you to make the most of your Social Media posts and increase your chances to show up in your follower’s news feeds. Tweets posted during the most frequented times of the day, generate up to 30 % more interaction. 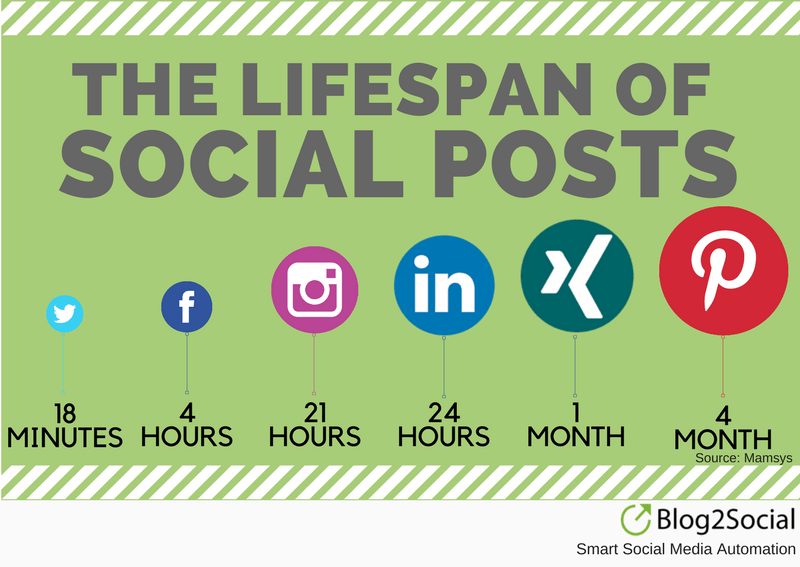 Apart from the best times to post, you should also consider the average lifespan of a post on different social networks. While on Pinterest your pins will be visible for a couple of weeks, the average tweet has a lifespan of only 18 minutes! So if you only share your content once, the majority of your followers will most likely miss it. Therefore, sharing your blog post more than once on different days and at different times is a great strategy to increase your chances of showing up in as many of your followers’ news feeds as possible. 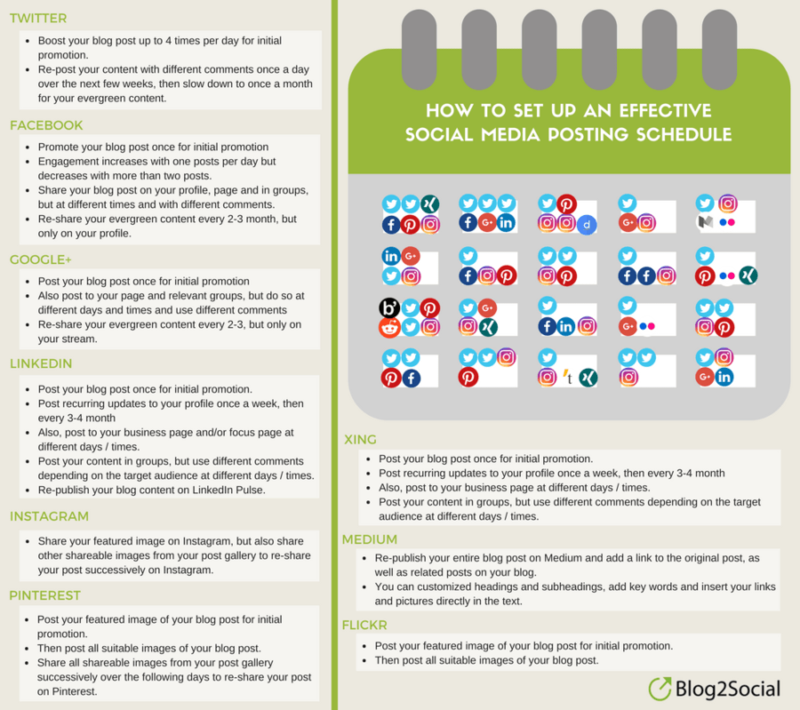 To save time, this is something you can plan ahead and incorporate in your social media posting schedule. However, when scheduling your posts recurrently, you should again consider your specific audience. Each network works differently and has different preferences regarding posting frequency. While on some networks such as Pinterest and Instagram you will generally receive more likes and interaction the more you post, being too active on other platforms can even backlash and hurt your posts performance. Again, in comparison to most networks, Twitter is very busy. Therefore, on Twitter you won’t annoy your followers as easily and can post your content 4 times during the first 36 hours for initial promotion. In fact, if you manage to post up to 20 updates a day you will get the best results in terms of interaction and engagement on Twitter. 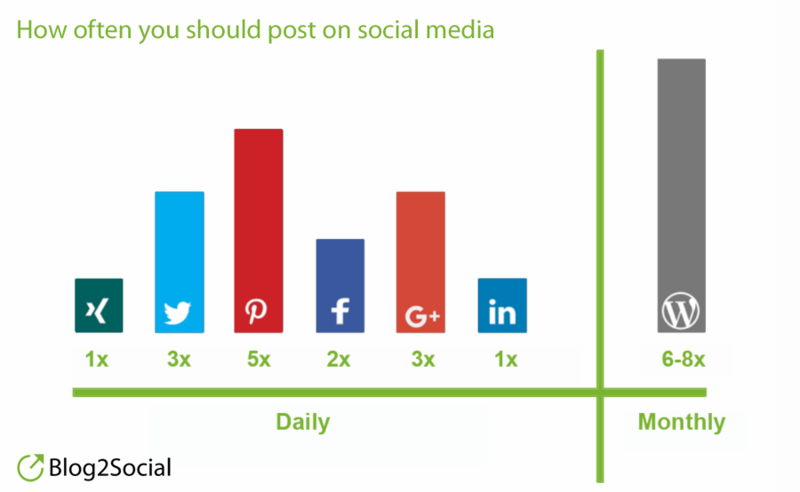 To get a better grip on all the Do’s and Don’ts on posting frequency, take a look at these general guidelines on how often to post to social media. If you want to drive traffic to your page, you should always take a look at all the resources you already have in store. Great and high-quality content requires a lot of effort to write. Therefore, if you already have valuable articles, guides and infographics that have performed well in the past, don’t let them dust over in your archives. Instead, re-share your best articles, videos and graphics recurrently. Chances are many of your followers haven’t seen your best article the first time you have posted it, so resharing your evergreen content is a great way to keep your social feeds busy, reach new readers and generate traffic for your blog. But don’t simply re-share your content with the exact same comments, images and hashtags. Once you have put so much effort in creating a valuable blog post, you should make the most of your content and re-purpose the content as much as possible. Time to get creative! Re-share your posts with different comments. Add questions to encouragereactions or directly ask for retweets and shares. Additionally, there are several other media formats you can make use of and easily create a multimedia portfolio for your content. Each blog post can be turned into a podcast or video tutorial, each infographic can be splitted into numerous sharepics. The possibilities and your potentials to boost your reach on social media are endless. Read and record your blog post and turn it into a podcast. Add it to your blog post for readers who prefer to listen rather than to read and share it on sites such as iTunes, Google Play Music, Stitcher, PocketCast. Turn long posts into a white paper or ebook that can be downloaded from your blog and serves as a takeaway for your followers. Share it on Slideshare, Scribd, Issue & Co.
Write a checklist or create an infographic which some up the key fact from your blog post and share them. Split your checklist or infographic and re-share parts of it as share pics on social media. Especially if you share numbered tips, followers will be curious to read the full article on your blog. Screencast your slideshow into a short video clip with a link to your blog post and share it on YouTube, Vine & Co. Incorporate all these versions of your original blog post into your social media posting schedule and reshare evergreen content recurrently on Twitter, Facebook, Google+, LinkedIn, Instagram, Pinterest and Co. to continuously drive traffic to your blog. You can even go one step further and syndicate your content on blogging networks, sharing platforms or other communities. Exposure to these audiences benefits your visibility and outreach and is the main objective when organizing an effective scheduling strategy. It’s up to you, whether you syndicate the complete copy of your content or only a part of it. Just make sure to wait a couple of days before you re-publish your blog posts. This way search engines will have the chance to index your original blog posts first. Re-publish your post in blogging networks such as Medium, Tumblr or Bloglovin. Re-publish your content on Torial if it is relevant for journalists. Syndicate your blog post to LinkedIn Pulse, if it is business-related. Syndicate your post as blog post to Quora. Social media is about networking and engaging, so make sure your content stream reflects this. Talking just about yourself and your products will turn people off and damage your brand. So try to mix things up and share content of other once in awhile. It will make your social feeds appear more diverse and interesting and, thus, lead to more followers and outreach. When setting up an effective social media posting schedule, this implies sharing a balanced mix of your own, promotional content as well as curated content of others and personal, content. 3 pieces of created content: This it content you have created, that’s relevant to your audience. Considering all different types of content, media formats when setting up your social media posting schedule is a good way to go. Scheduling ahead also gives you time to react to current events and engage with your community. You just started promoting your content on social media? Take these general guidelines on the ideal frequency and recurrent scheduling as a starting point for your individual posting plan. However, these basic rules do not substitute an in depth analysis of your own target audience. Naturally, it makes sense to set up a social media posting schedule which considers the exact times when you typically get the most traffic from your social media channels. Let me show you an example how we set up our social media scheduling plan and bring it into action. I show you how I usually go about sharing and scheduling a newly published blog posts. I also show you how we set up a scheduling plan for long-term social media promotion. We manage 5 corporate blogs with more than 14 social networks for each blog. Among all these social channels, Twitter is our strongest network in terms of engagement and interaction, followed by Facebook. We use these accounts to keep in touch with our customers, listen to our community and to establish new relationships with influencers or potential business partners. Pinterest is our strongest social channel in terms of website traffic.Pins are visible for a couple of weeks and regain visibility and reach every time they are re-pinned. So we tend to also focus on Pinterest when repurposing our content and use it to re-share our infographics and sharepics regularly. We start with a basic scheduling to all our social channels for initial promotion, adding different comments and hashtags to every post. I always consider how we want to address our audience on each network. Twitter users prefer short tweets up to 110 chars. For posts on Google+, LinkedIn and XING profiles, pages and groups I write longer comments and give a short introduction to the blog post for our B2B audience. With our social media automation tool Blog2Social I can edit and customize all social media posts individually with different comments and hashtags. I can also schedule them up to 52 weeks in advance and select different times and days for my posts. I can do everything in a one-page preview editor in my WordPress dashboard. This saves me loads of time for cross-promoting every blog post I share. After the initial promotion, I start setting up recurrent scheduling schemes for the long-term promotion of my blog post on Twitter, Facebook, Google+ and LinkedIn. I can set up a different frequency of social media posts with a variety of different comments, images, posts formats and hashtags. Additionally, I set up a separate scheduling plan for all visual elements of my blog post, infographics and images and schedule them successively for sharing on Pinterest and Instagram. Although, Blog2Social would let me do this all in one single step, I personally prefer to split my scheduling plan in two steps. I will show you in the last paragraph, how Blog2Social works for setting up a fully automated social media posting schedule. For Twitter I prepare about 4-6 tweets with different comments, images & hashtags to schedule them recurrently at different days, times and in different frequencies. During the first two week after publishing my blog post I schedule it to be tweeted at least once a day and occasionally add a second tweet with a different comment and image the same day. Afterwards I slow down to one tweet every second day for the next two weeks and 1-2 tweets a week for the following 4 to 6 weeks. On Twitter I also like to switch between link tweets and image tweets depending on the visuals I have in store. For my recurrent scheduling on Facebook, Google+ and LinkedIn the intervals I use are much longer. On these networks I try to reshare valuable evergreen content about every 2-3 month. To make sure not to forget sharing my articles again I already set up these recurrent schleuning scheme as soon as my blog post is online and change comments, images or post formats for some posts. Additionally, I try to spread my content by recommending it in suitable discussions in groups on LinkedIn, Google+ and XING. Last but not least, I set up an extensive Pinterest and Instagram scheduling to make use of all my graphics and visual elements. Apart from the featured image of my blog post I share all images, infographics and repurposed visuals successively to the image networks. For find free slots in my Pinterest and Instagram scheduling, I regularly check my Blog2Social calendar to fill available times in my editorial plan. 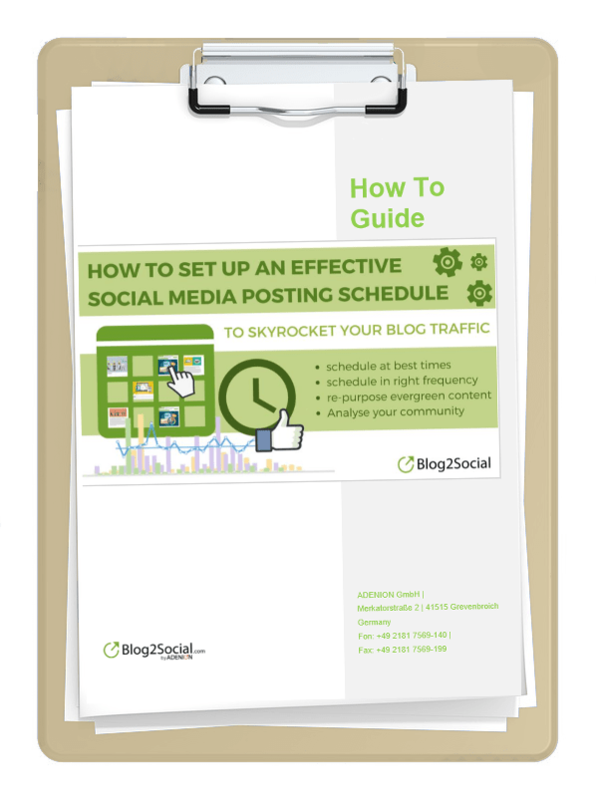 Setting up a perfect social media posting schedule is all about testing and optimizing. Each community has individual habits and preferences. Tracking your results should be your main focus when setting up your very own social media posting schedule. All figures and recommendations given in this article come from quantitative studies on engagement and reach. However, your specific audience might be completely different: active at totally different hours and accustomed to different posting frequencies. Take the best times and frequencies as template and guideline to get started, but continue with your own analysis.. Experiment with different times and frequencies and track your results. Most networks offer monitoring tools to analyse the response of your social media posts. Great features to get an overview of the most popular topics, times and post formats. However, don’t stop there. If you are really want to boost your blog traffic, take a look at your click-through rate and the number of people who have actually visited your website after seeing one of your posts on social media. Google Analytics is a great tool which can help you tackle these insights and derive actual measures from these data. The Google Analytics custom report shows when your audience is most active on your social media, and most importantly, visits your blog. Google Analytics will spill the beans and show you exactly how many users were directed to you website and which specific social network they came from, how long they have stayed and which platform generally drives the most traffic to your site. Analysis this data, you can then go ahead and optimize your social media posting schedule according to your very own audience and your personal best time to post. It’s already difficult to keep all these rules and differences regarding best times and right frequencies in mind when planning out an effective social media posting schedule. Manually setting up each and every single post will definitely burst your time management! However, when you are turning to social media automation tools, always look for tools that enable you to customize your social media messages, posting formats, scheduling times and frequencies individually. Simply sharing and re-sharing the same post with the message will not do the trick. a wide range of social networks to share on profiles, pages as well as in communities. customizing option that help you when setting up your social media posting schedule. variable scheduling options to target the best times and frequencies for each network and audience. customizable social media posts for each network and audience. The social media automation tool Blog2Social helps you to set up your tailored social media posts and posting schedules in one single place. I combines the benefits of automation with the benefits of individual cross-promotion. It takes all your individual needs into account and posts at the right time for your audience to generate maximum reach among your followers. The tool provides various scheduling features, from auto posting and sharing immediately to scheduling at a specific time or in a recurring scheduling scheme. Additionally, it also offers an elaborated social media calendar, designed to help you stay on track with your scheduling and match your individual team size. To help you hit the rush hours of each network and post your blog posts at the best times for maximum engagement, without looking them up every time you post, Blog2Social implemented the Best Time Manager. 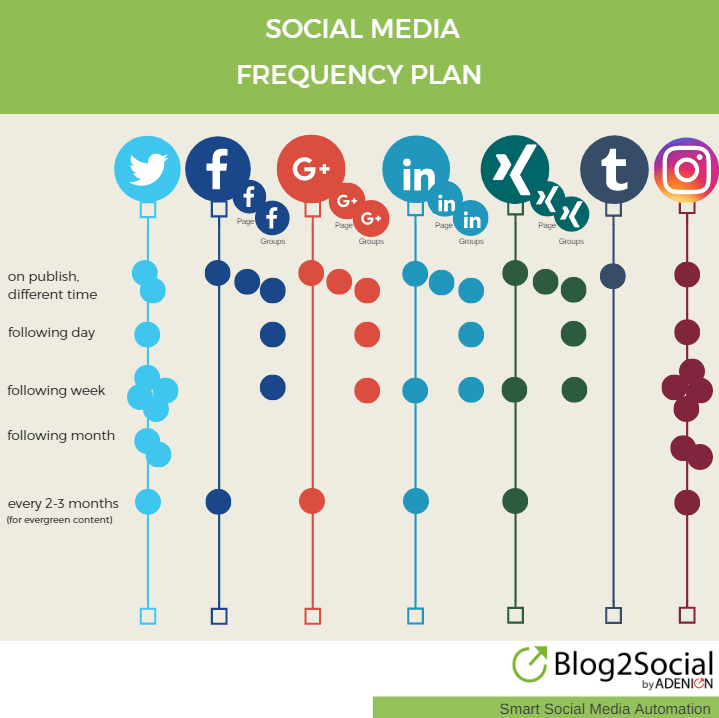 This way, you can schedule according to the most frequented times on social media or save your very own times, based on your own engagement and data. To do so simply insert the times your posts perform best in your Blog2Social Settings > Best Times Settings and click on ‘Save’. Later on, you will then be able to schedule your postings with a simple click on ‘Load my time settings’. Learn more about how to I set my own time setting to post on social media? in the Blog2Social FAQs. 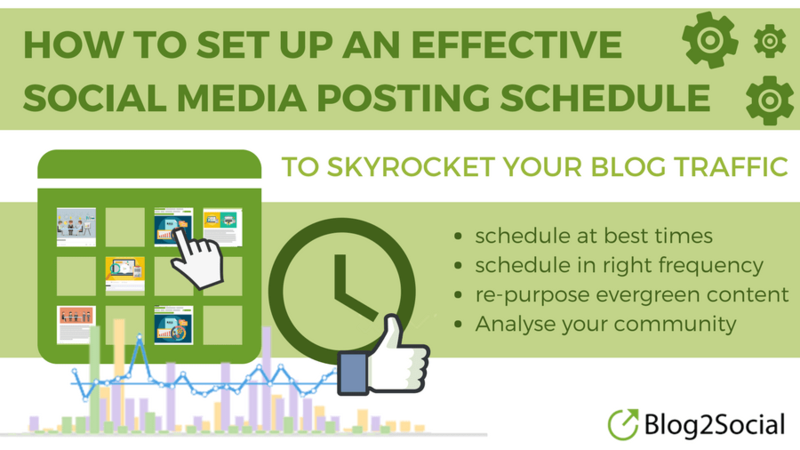 Set up an effective social media posting schedule, plan and have your content ready ahead of time. 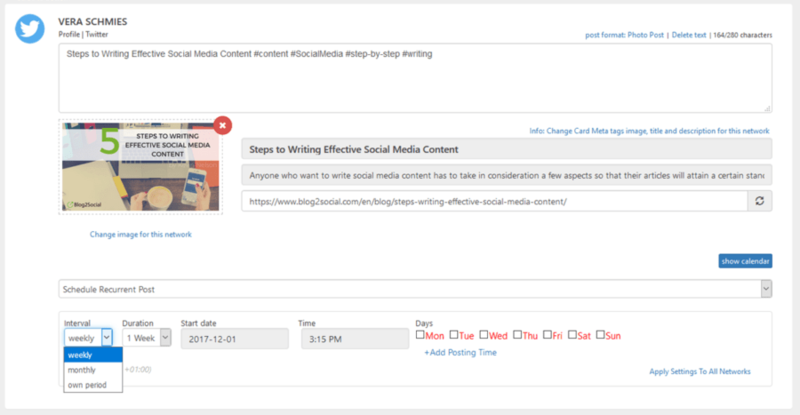 With Blog2Social you can schedule up to 52 weeks in advance. Choose whether you want to repeat your evergreen content every week, every month or according to your own chosen interval. Combine recurrent scheduling according to your prefered interval with your very own best times to create the perfect social media posting schedule for your audience. With this elaborated scheduling feature of Blog2Social, you can take care of all the essentials of recurrent scheduling with one single click. To do so simply select your preferred interval in the drop-down menu of your Blog2Social preview and choose the weekday and time at which you’d like to post. For a more in depth explanation and step-by-step guide, take a look at the FAQ: How do I publish blog posts on a recurring scheduling scheme? Easily reshare content that performed well in the past. 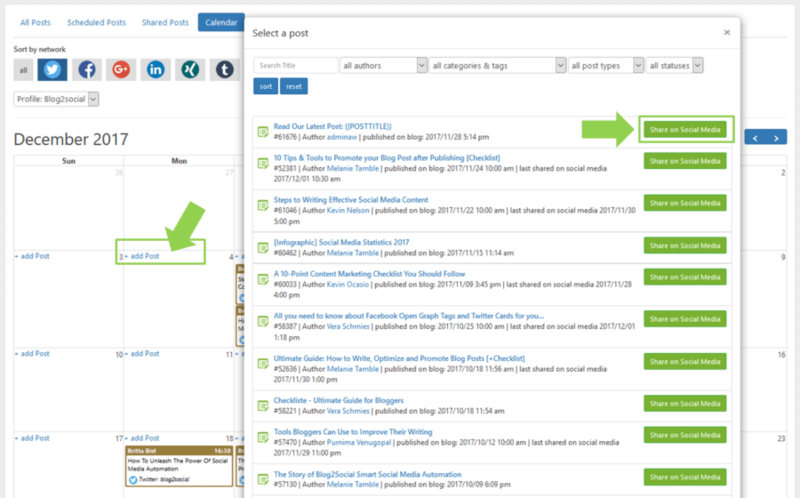 With the Blog2Social re-sharing feature you can repost your old blog posts and evergreen content in one single click. Due to the plugins integration in your WordPress backend, sharing your evergreen content is no longer tedious work. Blog2Social gives you a clear overview of all your published blog posts and lets you browse through and choose from your entire blog content. Integrate your evergreen content permanently in your posting schedule and set up individual, recurrent scheduling schemes to keep your social feeds busy with an interesting mix of content. Check out how to schedule evergreen content recurrently in the FAQ: How do I re-publish old blog posts? Additionally, you can keep a clear overview of all your scheduled posts and easily fill empty slots in your editorial plan by adding new posts with a simple click on the empty space in your calendar. Take a look at the calendar when scheduling new posts or directly add new schedulings in your calendar view. Choose the blog post you’d like to add to your editorial plan from the selection of posts and pages, published or scheduled for publication on your blog, in the pop up window. With a click on “Share on Social Media” you will then be forwarded to the Blog2Social preview to customize your Social Media posts with individual comments, images, hashtags and handles. Schedule your evergreen content to post for the next few weeks or month -- and then drop trending content into your schedule as it arises. Social media networks are more and more busy everyday and there will always be something new to like, share, retweet or comment. Keeping in touch with your community and actively engaging with influencers or potential business partners is something you cannot put on hold. To save time for your day-to-day business and engaging with your community, you can look to social media automation for help. Who doesn’t dream of intriguing social feeds, packed with articles, graphics, videos and personal comments every day? Social networks are among the most powerful sources for blog traffic and can help your skyrocket your page visits. Nevertheless, you shouldn’t blindly set your social media management on autopilot in hopes for more blog traffic. To make the most of your social media posting schedule, it should be closely adapted to your followers preferences and most active times. When choosing the right social media tool to put your individual posting schedule into action, you should always make sure that it gives you broad options for customization and lets you adapt your posting schedule individually.